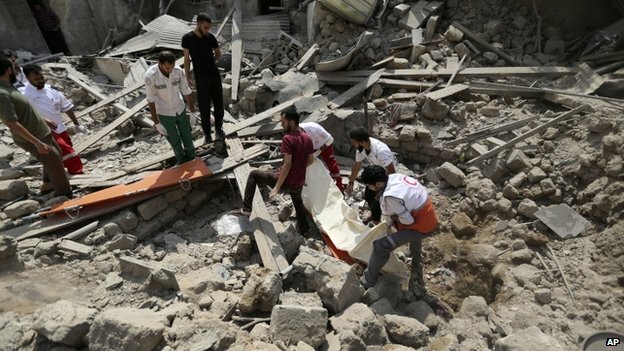 In Gaza there have been over 500 casualties so far in this latest chapter of the ongoing conflict between Israel and Hamas. Israel and its supporters claim that they have every right to defend themselves from the rocket fire hurled at their cities by Hamas from Gaza. They say that the Palestinians are to blame for this state of events by not ceasing fire, and that Hamas is using its people as human shields to protect its weapons. If all of this were true, there would still be no justification for this current wave of attacks from Israel. Gaza is a very small place with a very large number of people within its borders, who are not able to leave. Knowing this fact makes casualties when bombing impossible to avoid. If the Israeli leadership truly wanted peace they would go after only the people shooting the rockets, and not send missiles into civilian areas. Frankly, given how lopsided this conflict is, Israel actually has no strategic reason to go into Gaza given the fact that the iron dome protects their civilians, other than to massacre Palestinian people. At least this is the impression that their current actions give. Meanwhile, the media war continues, and something rather uncomfortable has emerged, which is reflective of the unwavering support for Israel shown by Western governments and media. It seems that it is nearly impossible for someone in the West to show sympathy for the Palestinian people or to object to the policies of the Israeli government without being labeled antisemitic. Several notable celebrities and others have tweeted support for Palestine and have quickly deleted their messages. Unfortunately, "antisemitic" has become a loaded and reactionary term which has been losing significance as it is increasingly misused, particularly in the context of this conflict. Surely there are some antisemitic people among those who do not support Israeli actions, but there are also Jews and others who simply object to the apartheid conditions in Gaza (and the West Bank) and the constant attacks by Israel, which has an insurmountable advantage. Yes, the Israel government have a right to defend themselves and their people. They have the support of the greatest military power on earth and a significant army themselves, along with a state of the art missile defense system, which makes this whole recent operation an exercise in futility that will only result in a new generation of Palestinians who want to shoot rockets at Israel. You cannot create terrorists and then complain when they shoot at you. You cannot put nearly two million people in what is essentially an open air prison and expect them not to fight back. If Israel wants peace they need to negotiate fairly and stop bombing. They need to improve the conditions for Gazans so they won't turn to Hamas anymore. They need to allow the people there to prosper instead of deliberately stifling their chances. They need to go after the bad guys who actually pose a threat, not the children. But I fear that inevitably this is a losing game for Gaza and Gazans, They have few choices left to them. Fight back and be destroyed. Submit and and accept apartheid.